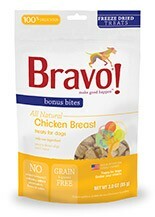 Bravo Bonus Bites® – great-tasting rewards for very good dogs. The quality and nutritional value of the treats you give your dog is just as important as the quality of the food you feed. Typical treats are loaded with grains and full of flavorings and artificial preservatives. So it’s good to know that Bravo Bonus Bites are 100% grain free and made entirely from all natural muscle meat, poultry muscle protein, fish muscle protein or organs, which means they are a natural source of good protein. Plus, they never contain any grains, fillers, flavorings or preservatives. Look for Bonus Bites in two tasty varieties – dry roasted or freeze dried. Feeding guidelines: Owner should always supervise their pet when feeding treats. Treats should be no more than 10% of your dog’s daily calorie intake. These treats are not a substitute for your dog’s main meal. They are for intermittent or supplemental feeding only. Package contains a non-toxic oxygen absorber packet. Keep in sealed bag for freshness. Do not feed to it to your pet.